A-MUSINGS » Blog Archive » OMD! Oh…My…Dog! It’s that time of year again. The season when many dog owners submit their quadrupeds to the ultimate humiliation. It’s worse than the cone of shame. 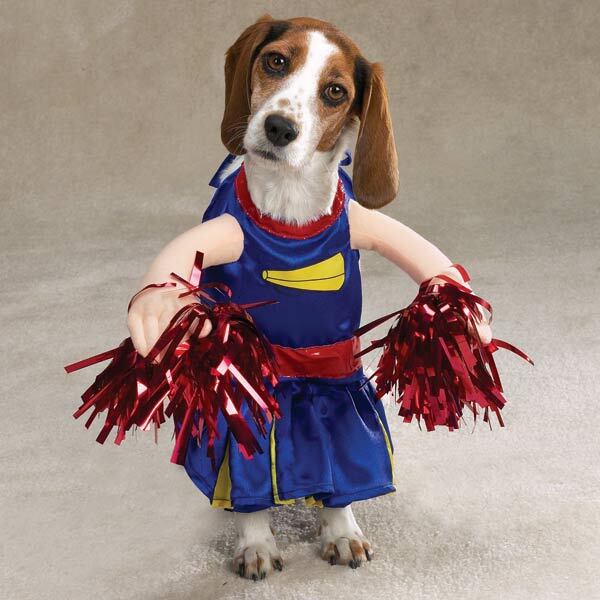 It’s…[not Monty Python’s Flying Circus] the dog Halloween costume! My inbox has been flooded with images of chihuahuas dressed as Yoda, and golden retrievers with Carmen Miranda fruit perched upon their heads and ruffles wrapped about their flanks, dachshunds either sandwiched inside hot dog buns or squeezed into banana suits, and one of the greatest affronts to canine pride — a greyhound in a grass skirt and coconut bra. Dog owners seem to delight in dressing their pets as other animals: butterflies, spiders, crabs, horses, dinosaurs, alligators, skunks, giraffes and bunny rabbits. (You’ll note that conspicuously absent from the list of animal costumes is the cat.) Why can’t you just appreciate your dog for what it is…a dog. Okay, okay. 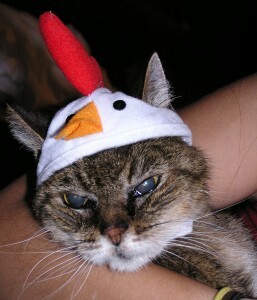 I will admit that one year, we did place a chicken hat on our kitty, Cleo. She was a very docile cat (which could be explained by the fact that she was about 147 years old at the time) and tolerated quite a bit. But we only kept it on for a few minutes…while we took pictures. The RSPCA (Royal Society for the Prevention of Cruelty to Animals) in England has actually suggested that people who needlessly adorn their dogs (especially dressing them up as little human beings) should be prosecuted. Fashion faux pas aside, there are actual dangers in dressing your dogs in inappropriate clothing. Dogs could easily overheat or injure themselves if they become entangled in restrictive clothing or trip in apparel that is too loose. While some clothing definitely exists for the welfare of the dog (for instance, specially made coats for small or short-haired dogs in the winter), the Paris Hilton doggy evening dress is just a bit over the top. So please, this Halloween think twice before turning your mutt in Elvis Pawsley, your Pomeranian into a pirate or Fido into Frodo. Consider their feelings. Their pride. Their dignity. Spend time instead, working on your own costume. And of course, there are always your children, grandchildren, nieces and nephews, whom you can dress up. And the added benefit is that you can take pictures of them and embarrass them when they become teenagers. Bonus. LOL!!! I just got off the phone with my sister-in-law who had asked me to dress Zoey and bring her to a parade. I explained that I respect and love Zoey a great deal. If she were able to say she wanted to play dress-up, and to choose her costume I would be all for it. Barring that — nu uh. She is a dog and she is cute enough the way she is! I have no objection really to others who feel differently and I think some of the costumes that have flooded my email as well are very creative. So I will laugh when I see some and my gut tells me Zoey will look and think ummmmm…huh?